Since the founding of Providence in 1636 by Roger Williams, Rhode Island has been ahead of its time in many ways—including being the first of the 13 colonies to declare independence from British rule! From the Gilded Age mansions of Newport to the beaches and bluffs of Block Island to Providence’s distinctive neighborhoods and unique downtown, Rhode Island is a small, shining New England treasure. 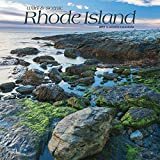 This square wall calendar offers a scenic tour of the Ocean State. • Great as a Gift or to Keep Yourself Organized – BrownTrout offers 1,000 different titles!